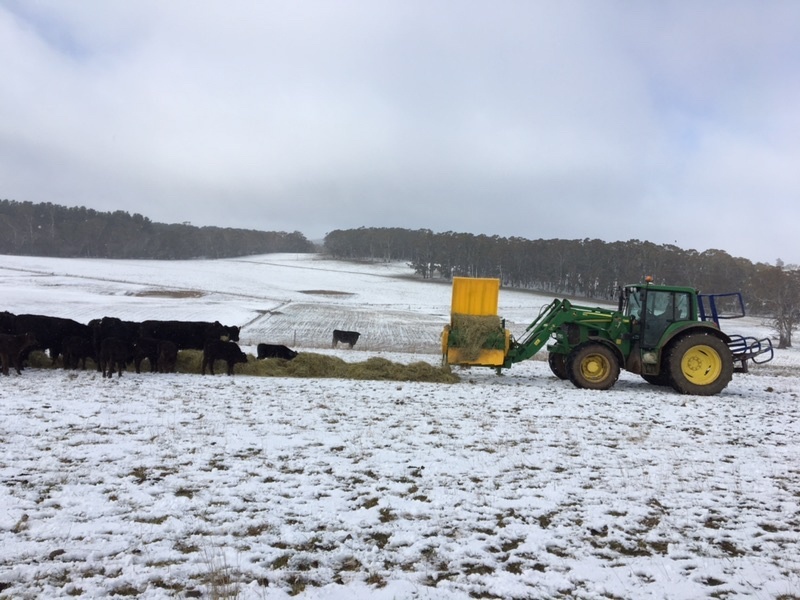 When Oberon’s Mark Mawhood saw his shy feeders and calves missing out on access to feed at the hay rings, and subsequently losing condition, he found the answer he needed in the Hustler Chainless X2400 bale feeder. Running the feed out in a line allowed every animal in the herd to access adequate quantities of feed without fighting. Mark Mawhood farms with his three brothers at Oberon on the central tablelands of NSW. They carry 600 Angus breeders and carry their progeny through to 420 kilos, before selling them direct to slaughter. 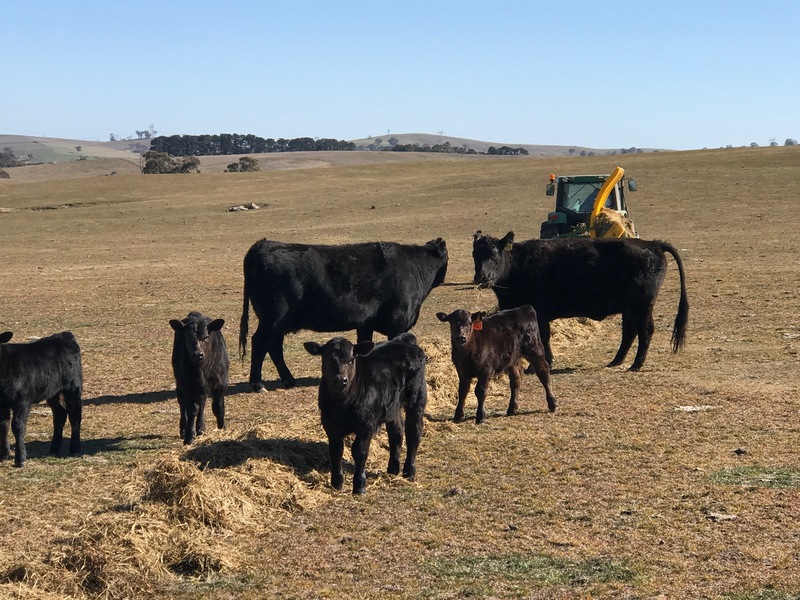 NSW is in the middle of one of the worst droughts in living memory and Mark and his brothers are coping with the feed demand for the herd at the end of calving. “It’s peak demand for feed for our cattle and because of the drought we’re finding we’ve got to feed twice as much as we normally would,” Mark says. Previously, as the cattle were starting to get hungry and needed to get fed more, the Mawhoods fed out into hay rings. we even had some losses when the cattle would get caught. Mark noticed a big tail in the cattle (animals losing condition as they repeatedly missed out on feed) so they started looking around for options. They investigated the Hustler models on the internet and then spoke to their local representative about its suitability for their operation. “With the Hustler bale feeders, you’re able to feed out a half or a third of a bale. You can choose how much you want to feed per mob, where traditionally you’ve just got to put the whole bale out. Especially with silage, you’re really utilising that bale to its full potential,” Mark says. The way the Hustler machines lay the feed out in long lines has eliminated the competition that used to exist among the animals to reach the feed. “When you run it out in a line, the cattle are able to access it. The Mawhoods purchased their first Hustler Chainless bale feeder in April 2018, because of the ongoing drought conditions. They were so impressed with the results that they bought a second unit of the same model just a couple of months later. “Since we’ve purchase the Hustler there’s been a fair bit of local interest with different producers asking what we thought of it. It’s all been positive. I can see a lot more of these units being brought into the area,” Mark says.